There are 92 excellent spacious en-suite private or semiprivate bedrooms all finished to an exceptionally high standard with satellite TV, phone and computer connections in all rooms. 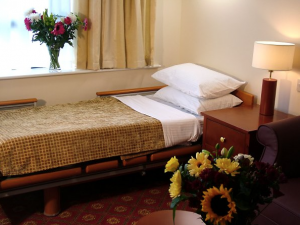 Beds are of the highest quality with adjustable bases for extra comfort and nursing care. 24 hour nursing supervision is available and care assistants are highly trained to provide extra attention to those who need a high level of assistance. All units offer fully equipped kitchens and spacious living areas. All facilities and services of the TLC Centre will also be at their disposal including room service and 24 hour medical and nursing cover.